Baskin Robbins has earned an average score of 95.5 out of 100 on health inspections through the past nine years, records show. A fixture of Main Street in New Canaan, the candy and ice cream shop has scored 92 and higher through 16 unannounced inspections conducted by sanitarians with the New Canaan Health Department since October 2008, according to a review of the organization’s files at Town Hall. “Sanitarians work to help food establishments maintain compliance and, as a result, New Canaan on the whole fares well on inspections,” DeLucia said. 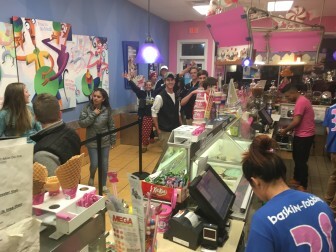 Baskin Robbins’ minor violations include labeling sauce bottles, replacing a broken refrigerator door gasket and spoons submerged in candy containers.